Automatic Voltage Regulation : Eliminate feed speed variation caused by mains voltage fluctuation. Soft Startup : In order to avoid sudden shock to the feed material and vibratory feeder, the controller can gently increase output voltage from 0 to the preset value when startup. 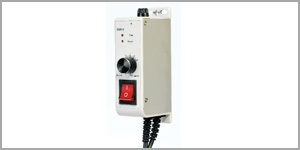 Linear Voltage Control : Rotation angle of the voltage adjustment knob is linear with output voltage of the controller. Overheat Protection : If internal temperature of the controller gets too high, the controller will stop its output to protect itself. Overcurrent Protection : If output current exceeds its rated value by mis-operation, the controller will stop its output to protect the controller and vibratory feeder. Short-Circuit Protection : If output of the controller is short-circuited, the fuse inside the controller will be blown to protect the controller and vibratory feeder from further damage.